Increasingly stringent demands are being imposed on the efficiency of gas turbine engines employed in the aerospace and power generation industries. This is driven by the requirement to reduce consumption of fossil fuels and thus operating cost. The major means for improving turbine efficiency is by increasing operating temperatures in the turbine hot section of the engines. The materials employed must withstand the higher temperatures as well as mechanical stresses, corrosion, erosion and other severe conditions during operation, while providing extended lifetime as required by the end users. This is an area where coating processes make a significant contribution today. 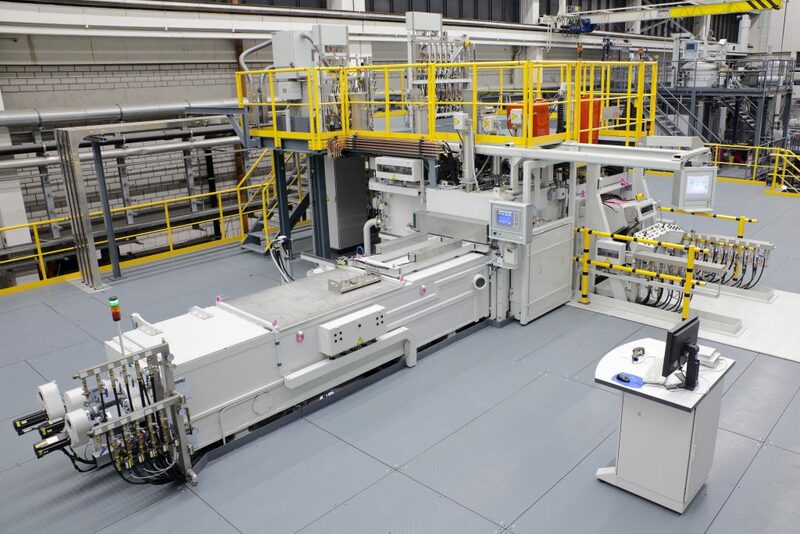 ALD’s mass production EB/PVD systems are equipped with one central coating chamber incorporating two electron beam guns and a reservoir of zirconia ceramic which allow the operation of the coating process for several days. The EB generates a homogeneous cloud of vapour in which parts can be rotated, tilted or both at the same time, matching the part geometries and the specified coating thickness distribution requirement. Two-Layer Coating system , e.g. for CMAS-protection and low-k applications can be relized by the integrated ingot translation mover (ITM) which allows the depostion of two different materials within one coating run. The high performance electron beam evaporates metals as well as ceramics. Bond, diffusion and thermal barrier coatings can be produced in a step by step process n with high deposition speeds. The EB/PVD process generates a thermal barrier coating with controlled thickness distribution of layers, with superior dendritic structure, firmly anchored roots and smooth surface properties. The TBC coating absorbs high thermal stress and enables higher turbine operating temperatures, which delivers the intended benefits of reduced fuel consumption, higher efficiency and longer turbine lifetimes. Basic Design (SL XXL) consists of coating chamber, heating chamber and loading- / unloading-chamber. The modular design allows further extensions: e.g. retrofit to a 2-feeder coater (DL XXL) is possible. ALD offers 40 years of experience and dozens of references of coating systems for blades and vanes. The 4-feeder coater (DTL XXL) enables continuous mass production of turbine components with high throughput and efficiency.